I imagine it is possible to do good woodworking with mediocre tools, but who would want to if better options are available? Yet, it would be a rare woodworker who enters the craft with a full set of tuned, high quality tools. Trying to coax good performance from a fundamentally poor tool is futile. A chisel made of lousy steel or a table saw with a wobbly arbor will never work well. Stay away from these. At another level there are tools that are OK. They usually get the job done, maybe without a struggle, though not often with ease. These tools are not likely to inspire confidence. 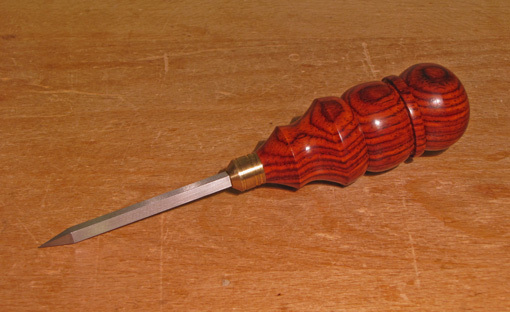 A woodworker reaches for this kind of tool not with eagerness but for lack of something better. Practically, however, used with a bit of finesse, these tools may be good enough, or maybe they just allow us money left over to buy other tools or to eat. My drill press falls into this category. That’s life, and so on. Then there are the tools you really want, those that inspire confidence and are dependable. These are the shop players that you give the ball to in crunch time. 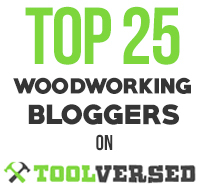 While no one would reasonably contend that tools alone make the craftsman, these tools can help make you a better craftsman and are likely to extend your skill and range as a woodworker. Get them on your team. The odd thing about all of this is that these thoughts gelled due to my recent experience with a very simple tool, a birdcage awl, also called a square blade awl. I had been using a widely available “OK” version without feeling particularly deprived. Then, at a recent Lie-Nielsen Hand Tool Event, I was demonstrating at a bench next to Bob Zajicek and his array of Czeck Edge tools. 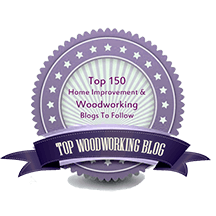 I knew it was only a matter of time – I picked up one of his awls, tried it out, and . . . so that’s how the song should be sung! I could feel how this type of tool should really work. 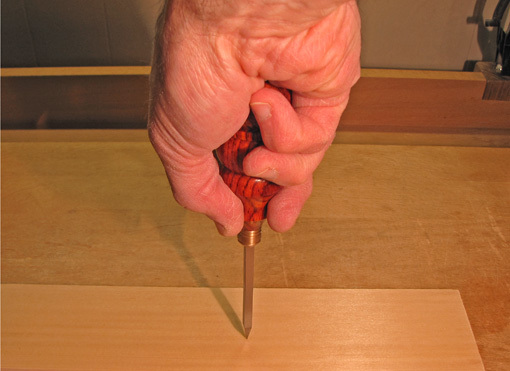 The handle is more than beautiful; it facilitates placing, pressing, and twisting the tool. The precisely formed edges of the blade do the actual cutting and allow it to fly into the wood. So I bought it, and back home in the shop it is becoming a go-to tool for a variety of tasks including marking and starting holes, boring small holes, and other marking tasks. An excellent tool! It is remarkable how the simplest tools can have subtleties of design and use that elevate their functionality in the shop. Card scrapers are another example of this. What are your thoughts on the handle details? As a writer and a woodworker, I’m always drawn to turned pens when I go to art shows. And I’m always amazed by the beading and grooving people carve into the first inch of wood by the head of the pen – the part where everyone holds it when they write. I’ve tried using a pen with tool work in that area and it is uncomfortable after a minute of writing and unusable after two. It might look pretty, but it destroys the function of the product. 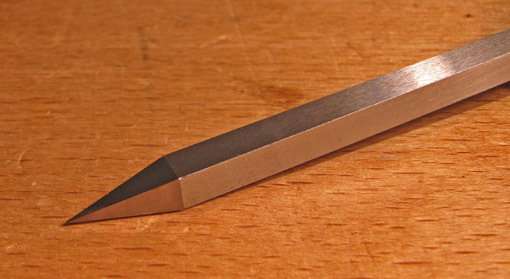 I noticed the Czech Edge tool marking knife and awl handles seem to have this sort of decorative touch added to them and that has caused my hesitation in buying them (well, the awl – I already have several really good Blue Spruce marking knives and feel absolutely no urge to try or buy anything else). I find the handle to be an excellent combination of functionality and aesthetics. For my medium-sized hands, the palm wraps comfortably around the convex contours of the upper part of the handle which looks somewhat like two balls separted by a ring. This naturally imparts a good grip. The concave contours of the lower part of the handle are just right to accept the distal parts of the fingers. So when you grip, the fingers naturally pull the upper handle into the palm. At the same time the fingers feel a nice sense of control. The two prominences at each and of the larger concave section in the lower handle do not at all feel harsh as one might guess just by looking at them. On the contrary, they seem to act as pleasant landmarks for the fingers. Well, this is a lot of words, but I think once you pick it up AND use it, your hand will tell you what mine told me: yes! I sampled several of Bob’s marking knives and found that their beautiful handles also felt good in my hands. I am amazed by the high quality of tools being developed and made today. It seems like the industrial revolution created an attitude that hand tools were second rate. Development stopped, quality went downhill, and in many cases whole companies went under or were lost to mergers (Disston). Today, we see Stanley reintroducing quality planes and a multitude of smaller makers not just making high quality tools, but in many cases, completely rethinking them and making them better than what our ancestors used. I think its exciting! I agree. We are so fortunate to now have woodworking hand tool makers with great knowledge, skills, and passion. I like to support them.